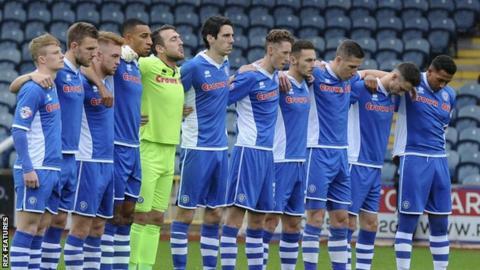 Rochdale manager Keith Hill has called on fans to get behind the team after growing tension between them. Dale came from a goal down to beat League One's bottom side Colchester 3-1 at Spotland but there were some unhappy supporters in the ground. Before the win Hill's side had lost three games in a row. "I'm really disappointed with the atmosphere and disconnect between the supporters, the team and our philosophy," said Hill. He told BBC Radio Manchester: "I'm not angry about it, I just hope that the people who helped us create promotion twice, reach the play-offs and a highest-placed finish in League One help us establish instead of destroy and show a little bit more patience. "I get this feeling that because Bury are in our league that we should be matching what they're doing. "We shouldn't be looking at it like that, we should be looking at protecting what we've created because it is special and it can be special for a lot of players."